Two nights ago, at another dinner with our friends Richard Clark and Mary Stec at their home, Richard pulled out two amazing bottles of wine – a 1992 Joseph Phelps Insignia and a 2007 Aubert Ritchie Vineyard Chardonnay. Two AMAZING WINES!!! 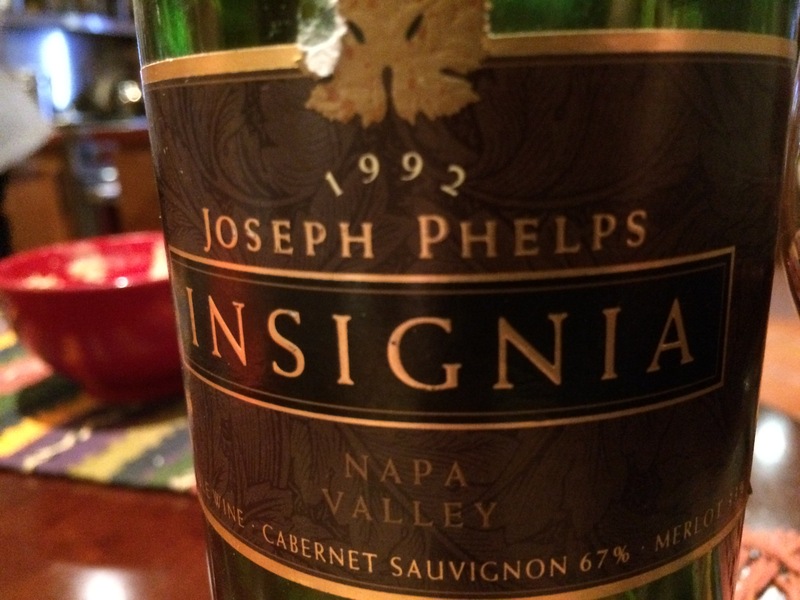 The Insignia was rich, lush, fruity – it seemed young, rather than 22 years old. After sitting in the glass for about 15 minutes, it opened beautifully and rewarded our short wait with a beautiful wine experience. A couple of years ago, Dorianne and I went to an 11 year vertical tasting of Insignia, from 1995 through 2005. This wine would have fit right in, naturally. The Aubert on the other hand, was perfect as soon as it was opened. There is a significant sense of sweetness, which I described as caramel, on the nose, with undertones of spice and fruit. This wine had a viscous mouth feel, not unlike the Insignia in this regard, and had a very nice finish. This was my first experience with this wine and winery. It ain’t cheap, but it offers a very special experience. Yesterday, we stopped at Trader Joe’s to get some groceries. I decided to get some wines for Thanksgiving (see earlier post – Link). The display of Nouveau Beaujolais was right there, so why not? I picked up a bottle of 2014 Georges Deboeuf to have with dinner last night. It was probably a mistake to have this wine the night after enjoying the superb Joseph Phelps Insignia and the Aubert Chardonnay. That said, the Beaujolais Nouveau is sort of like soda pop without the fizz. I actually found it to be more palatable than Dorianne did. I had the wine with some chevre and sourdough bread, then with a bowl of homemade chicken soup. So, we have done our bit for the Beaujolais Nouveau craze in 2014. Time to move on. Oh, I bought two bottles. Well – looks like an addition to the Thanksgiving table!